The Freeport Harbor Channel Improvement Project is a $295 million federal cost-shared project that was authorized by Congress in 2014. It consists of the deepening and partial widening of the Freeport Harbor Channel and related navigation improvements. Federal investment for project construction is expected to total $165 million upon completion. Port Freeport’s commitment to this project is $130 million, the amount of the bond package approvedon the May 5th ballot. The Freeport Harbor Channel was deepened to its current depth of 46 feet in the early 1990s. 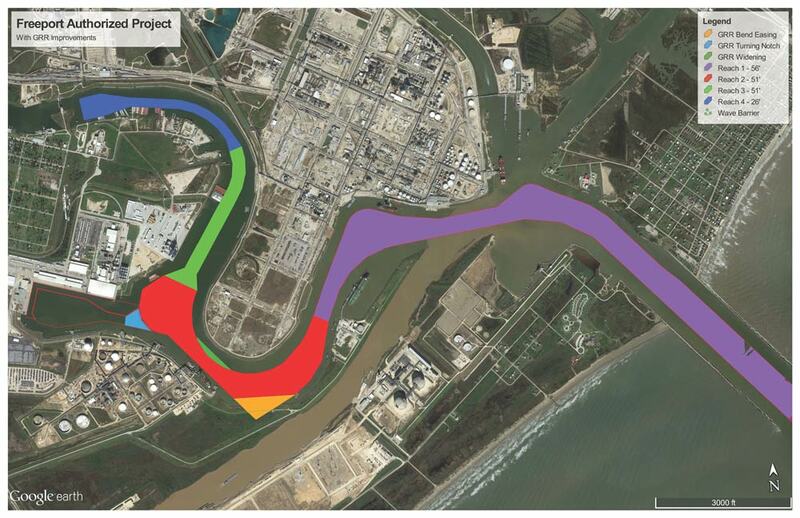 The Freeport Harbor Channel Improvement Project will further deepen the channel to authorized depths of 51-56 feet, making Port Freeport the deepest port in Texas and opening the state to larger ships. The project also includes enhancements to the upper turning basin, selective widening of the channel and lower channel bend easing, making it easier for modern ships to navigate. Since the current channel is not designed to handle the larger vessels that are in service today, a deeper channel will enable Port Freeport to market the Port to a wider range of global vessels, expand capacity and customer base and potentially attract new liner services. This, in turn, is expected to facilitate additional economic opportunities.